I have always known clutter has a negative effect on me. Just looking at it makes me feel anxious and crazy. When watching the show Hoarders, I swear I start to break out in hives. I can’t be the only person who starts instantly cleaning and decluttering after viewing a 30-minute episode. We all know hoarders have a “problem” yet most people are suffering from the same issues just in a less obvious form. Too often our lives become so chaotic and we consume too much that it has aided in the rise of anxiety and depression. So how can a minimalist lifestyle help? 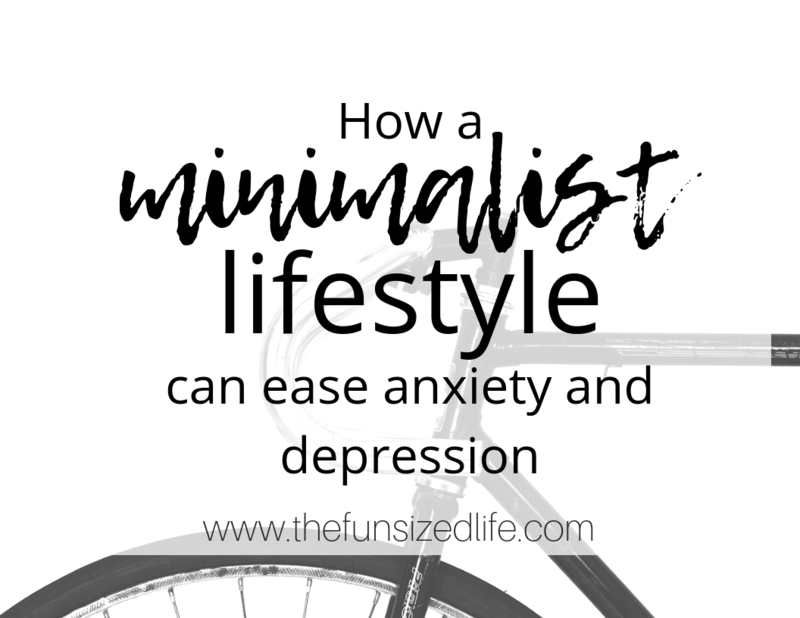 Many studies have backed up the fact that a minimalist lifestyle can ease your anxiety and depression. Keep reading and I will touch on the top points and share some practical actions you can take. There is no denying that we live in a world where we are constantly being visually over-stimulated. You can hardly walk down the street without seeing changing billboards, adds in every window, TV’s flashing commercials, and a smartphone in your face. All of these things can lead to major sensory overload. There is just too much going on. Seeing these ads all the time, or viewing other people’s lives on social media only increase the urge people feel to buy more, own more and have more. Then they are going home to houses that are filled with more visual clutter. All of this stimulation is overload for our brains, especially for those who are already more prone to anxious thoughts and depression. Depending on your level of clutter, you may require more assistance when it comes to decluttering your home. People with a strong attachment to their things often require psychological help in order to come to terms with letting go of their stuff. If you know you are ready to be done with clutter in your home, then my first piece of advice is to just get started. A minimalist lifestyle begins when you make the conscious decision to make a change. Chances are, there are things you know you don’t need. There is stuff you have been dying to get rid of. So get rid of it now. Take a Saturday to clean house. I know it’s not always fun doing this type of work on your day off, but it will benefit you so much in the long run. Don’t even get me started on the number of times I used to try on 18 different outfits in one morning only to get more and more flustered with each new one. My clothes would then be left in a pile on the floor and I was late for my day. Owning less items, whether it be clothing or not, means we have less decisions to make each day. If you have only one coffee mug to use, then you won’t spend your time fumbling through the cupboards. When you only own one jacket, then you know which one to put on in the morning. When we already have jobs, school, relationships and other worries taking over our brain, there is no reason to over-load our worried minds with useless stress. Owning too many things and giving ourselves too many choices only adds to our anxiety levels. Who wants to increase their worries over something as insignificant as what shirt to wear in the morning? No one. Yet most of us do it every day. Instead of spending your days worrying about not getting the right outfit, or not finding your coffee mug in the sea of cupboard clutter, try the minimalist approach and let it all go. When it comes to places like your kitchen and your bathroom starting the decluttering process can be really simple. If you have more than one of something, get rid of all but one. Have 3 bottles of shampoo? Toss two. Hanging onto 32 different 32oz cups? Pick your favorite one and move on. As far as downsizing your wardrobe, there are several tips from people who have chosen a minimalist lifestyle. Check out my post on creating a minimalist wardrobe for some great ideas on how to make a plan that works for you. When you have started living a minimalist lifestyle and created a clean space with less decisions to be made each day and fewer objects to tend to a magical thing happens. Now that you have less worries, you’re able to have more awareness. Clearing clutter from your home will not eliminate all of your stress, anxiety or depression. What it can do is lighten the load. When you give yourself fewer small things to worry about, you have more headspace to focus on the bigger worries that actually matter. Allow yourself this time to pay attention to your thoughts. Which ones keep re-occurring? Notice those trends and patterns of anxiety so that you can work through what’s bringing them on in the first place. The first step toward getting rid of negative thoughts is taking the time to acknowledge that they are there in the first place. Most of us have certain triggers that will bring on our thoughts. Being aware of those triggers can instantly help us start processing our worries before they completely take over. Ahh, here’s my favorite one. When you have less stuff, you have less to clean. You have less to repair. Less to worry about. A smaller wardrobe means less laundry. Fewer dishes means less time washing dishes. This is a huge reason why we downsized our house. I was tired of wasting time picking up toys, vacuuming, and cleaning. I wanted my time and my freedom back. Downsizing was the first step to living a minimalist lifestyle for me. It meant I would no longer be wasting my precious time on things. What can you do with more time? Anything you want. If you have big worries or major goals you want to work toward, take this time and do it! Have you been trying to get in a 30-minute walk each day? Do that! Making time for exercise each day is a great way to help fight anxiety and depression while also taking care of your body. If you are no longer wasting 30 minutes dressing repeatedly, you have 30 minutes to go over your notes for the presentation you have today. You have time to get a healthy lunch together so you’re not stressing about another unhealthy fast food decision. However, you choose to spend your extra time, do it with the intention to help make your day a little less stressful. A minimalist lifestyle can help not only with clutter and time, but it can also help with finances. When you are purchasing less things, you’ll naturally have more money. What can you do with more time, less stuff and more money? Go out. Do things. Experience life. Taking the time and energy to have more life experiences is a great way to naturally increase your mood. Get outdoors, take in the sites. Spend time with the people who make you laugh and enhance joy in your life. Now is the time to go out and have those experiences you’ve always thought you couldn’t have. That’s what a minimalist lifestyle is all about after all. Living purposefully and spending time on things that increase joy rather than take away from it. Take the extra time you have and start planning a vacation. Less and less people are taking advantage of their vacation days and it’s only adding to the anxiety and depression problems our world is faced with today. Plan a date night, take a yoga class, enjoy a weekend getaway. Take a moment to think about what it is that you have always wanted to do. Do that. Because hoarding truly stems with an obsession of things, it really is a way of putting possessions before people. You may not consider yourself a hoarder, but if you do struggle with letting go of possessions there is a good chance that it is standing in the way of your relationships in some way, shape or form. When our minds are so consumed with the desire to have the next best thing or own the latest trends, we are taking our focus away from more important areas of our lives. Not only can our consuming thoughts be aiding in anxiety and depression, but they are also taking away time. It’s crazy that not owning something can still take away our valuable time. Yet it happens every day. Start each day with gratitude. Gratitude and a minimalist lifestyle actually go hand in hand. When you begin your day by writing down all of the things you are grateful for, it lessens your desire to want more. Get a gratitude journal together. You can see my simple notebook from Target here. Have you ever watched those home makeover shows where they work extra hard to create a beautiful master bedroom for the couple? It’s because they know the importance of feeling relaxed and at ease in your own home. Clutter does not help this cause. When we go through our day to day lives and experience stressors and events that caused us some anxiety, we should not be coming home to a house that only makes us feel worse. Home should be a haven. Our homes should be an escape from the rest of the world. Unfortunately, a lot of time clutter robs us of this opportunity. People often believe a minimalist lifestyle is all about owning less stuff. This is a great step and absolutely part of the deal but really it’s so much more than that. It’s about creating peaceful environments, freeing up time, and focusing on things that make us feel better and happier every day. I say get a minimalist home inspired Pinterest board together. You can use mine as a starting point. Use these ideas as a place to put ideas toward creating a minimalist home that you love. Start decluttering anything that doesn’t fit in the space. The best part is, creating a minimalist home, usually doesn’t require buying a ton of new stuff. It’s more about getting rid of the unnecessary stuff you already have. We already know that anxiety and depression can lead to over indulging in things like food so it would make sense that clutter and over eating go hand in hand as well. A study conducted in Australia in 2017 took 101 undergraduate students and put them in either a cluttered kitchen or a clean kitchen to see whether or not their environment would affect their eating habits. While their mindsets played a major role in whether or not they over-ate, their environment played a major role as well. Those in the cluttered kitchen were more likely to consume more food during the study. A separate study that was done on children (I can’t recall the information) found that children would eat more when watching television. The good news was whether it was Goldfish or grapes, the children still consumed more. The bad news is that it just goes to show that over-stimulation really does make a huge difference in how we treat our bodies. I don’t know about you but I’m starting to see a pattern with how to handle all of these different problems that can arise from clutter. Get rid of the clutter. Do what you have to do to create a peaceful environment in your home. You only stand to benefit. At the end of the day, clutter can affect your mood, your money, your time and even your tummy. Most importantly, it affects you. Clutter can affect your every day life, increase your anxiety and depression and make day to day living harder to get through. Some people think adopting a minimalist lifestyle means turning into a crazy person with no possessions. I personally feel like it’s just getting back to our roots. Eighty years ago depression and anxiety in adolescents was almost non-existent. I like to think that it just might be because there was less of everything. Less food, less technology, less stimulation. Don’t get me wrong, I love this technology. I would probably die without my dishwasher and technology is amazing in so many ways especially when it helps connect us to people from around the world. It’s when we have too much of all of it that it really becomes a problem. So, take a step back, get back to simpler times and I promise you, you will start to find more time for yourself. Create more time to do the things you love to do. Own only things that enhance your life. Just get back to you. Wow… this is so true! I totally agree with you. Thanks for sharing this post. Thank you Sandra. it’s amazing the difference it can make!